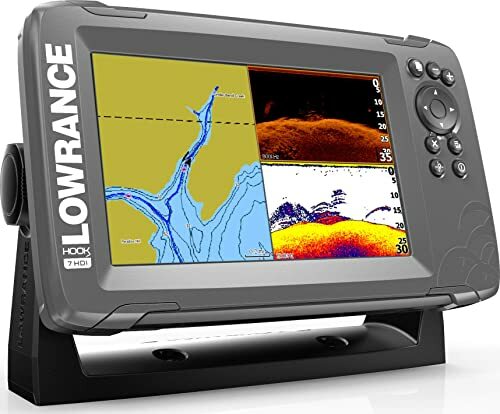 In this review, we are going to show you the best Lowrance Hook2 Series unit. After that, we will also point out the difference between the Lowrance Hook and the Hook2 series later in this guide. We're going to answer some of the most frequently asked questions on the Hook2 series. With this in mind, let's get started. 1. My Lowrance Hook2 7 will restart randomly when I have downscan turned on. How to fix it? 2. Why is my Lowrance Hook2 4X not showing speed? 3. Lowrance or Ipad Screen ? 4. Does The Lowrance Hook2 Have A Mapping Problem? 5. Which is better; the Lowrance Hook2 7 vs. Garmin Striker 7? 6. Has Lowrance retired its HSTWSBL era transducer with Hook2? 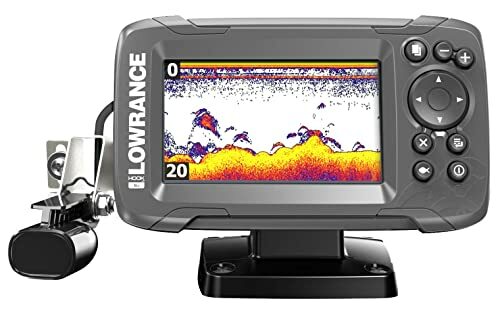 The 4.2 inches Lowrance Hook2 fishfinder is equipped with a lot of fantastic features to make your fishing hunt a breeze. The main function of HOOK2 is to help you spend more time fishing and less time playing with settings. 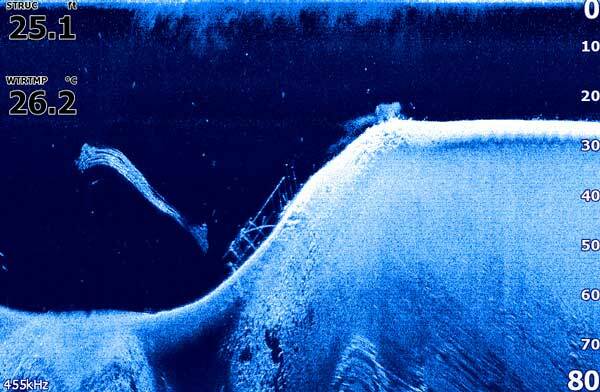 With the aim to create an enhanced sonar clear display and imaging, the Autotuning Sonar imaging was introduced. Housing 3lbs weight design, the Hook2 mode features an autotuning sonar to help you correct your settings automatically to the clearest underwater view. This means you won't need to carry out any manual adjustments when setting up the transducer. 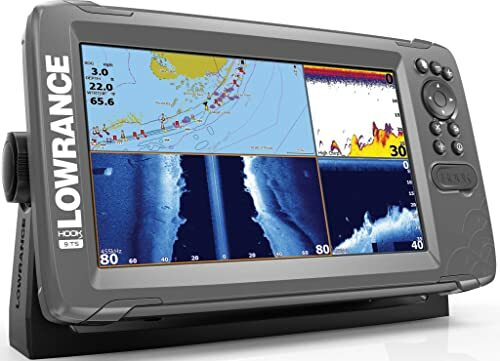 To even make this fishfinder more crisp and clear, the Lowrance Hook2 features a SolarMax display to give you an ultra-wide and clear viewing angle, which translates to the best resolution you can find around. This means you have the full detail of underwater view without tilting your head or adjusting your body. While this unit offers a multiple sonar functions like a circular flasher, Bottom Range, Fish ID, it also houses a basic GPS plotter that looks like those of Garmin Striker device. My little complaint is that the GPS plotter doesn't come with specified frequency or channels. But it does offer a blank page to help you mark waypoints and save routes. The waypoints come with longitude and latitude coordinates to track the vessel's movement on the white sheets. The HOOK2 4X also did a nice job by offering a Tripleshot transducer that allows you to mark fish, track baits, identify the underwater structure and help you scan large areas. It also offers a 3 in 1 model that allows using the PLUS SideScan, traditional high CHIRP, and DownScan imaging. 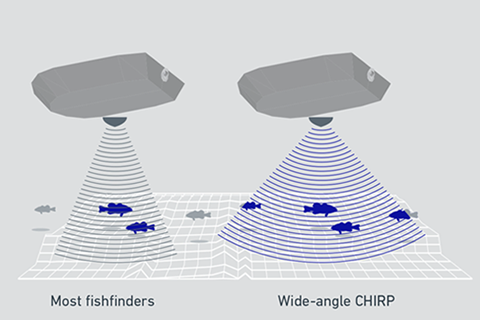 The included Wide-Angle CHIRP sonar is an awesome feature that deserves massive. This fantastic feature does not only double your sonar coverage but also allows you to view more fish in the water column. You will be able to cover more water in less time with this wide-angle CHIRP. The Hook comes with Quick Access to Key Functions, which makes it one of the most intuitive fishfinders on the market. The Function of the direct-access keypad helps to reduce the time spent working on settings, and let you keep your focus on fishing. The HOOK2 4X also features a preloaded C-MAP® US Inland mapping system to allow you to narrow your search for efficient water features. This can be drop-offs, points, and ledges with a broad eye view. Due to its awesome performance, this fishfinder comes with a one-year warranty. While this unit looks awesome, I do have some main complaints. First, the unit did not come with adequate instructions. Another major complaint is that it has no Downscan, Sidescan, or Structural scan. While that is true, it can't see in elevation, and the GPS unit is in minimal quality. On top of that, the top screen has a broad color band which interferes with bottom depth - Only 2000 points allowed, so the trail ends in a matter of hours. I can understand this is why it is cheap. I also wonder why Lowrance chooses to make its keypad operational. The HOOK2 5 - 5-inch comes with the same sweet perk with the HOOK2 4X - 4. One of the remarkable differences between the Hook2 5-5 and the HOOK2 4X - 4-inch is that the former is 6 inches in size, compared to 4.2 inches size of the latter. While that is true, it also retains the same impressive features of the previous generation. Its uniqueness comes from the ability to supply navigation features for inland fishing, and an optimal array of sonar, while eradicating unnecessary features that have no significant effect. The introduction of the SplitShot transducer paves the way for a Wide-Angle High CHIRP and DownScan. This feature lets you scan depths up to 500 ft (152 m), thanks to its Wide-Angle High CHIRP mode that can scan up to 300ft (91m) when using DownScan. The best part is that it can maintain an efficient fish targets reading at speed up to 20-30 MPH. Apart from that, the SplitShot transducer also integrates a temperature sensor and features 20 ft (6 m) of cable, alongside an 8-pin connector. The DownScan Overlay features let you use both the two sonar technologies to help you get a clear understanding of the position of the fish arches and their vegetation structure. 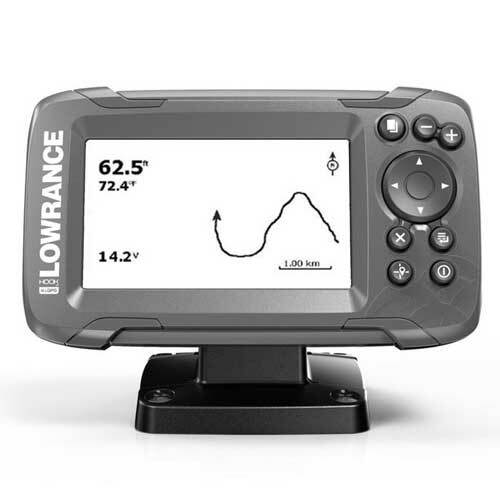 Unlike the Hook2-4x, Lowrance Hook2-5 is equipped with a standard GPS alongside the US Inland charts. The high-sensitivity internal GPS can also use the information from, EGNOS, WAAS and MSAS satellites to deliver the most accurate results possible if they are available in your area. This GPS will calculate the speed of your vessel and show you coordinate patterns. With the C-MAP charts, you will get a high-detail US mapping alongside 1-foot contours for more than 3,000 lakes. Even though they don’t deliver super detail, they will show you the boundaries between land and water accurately. 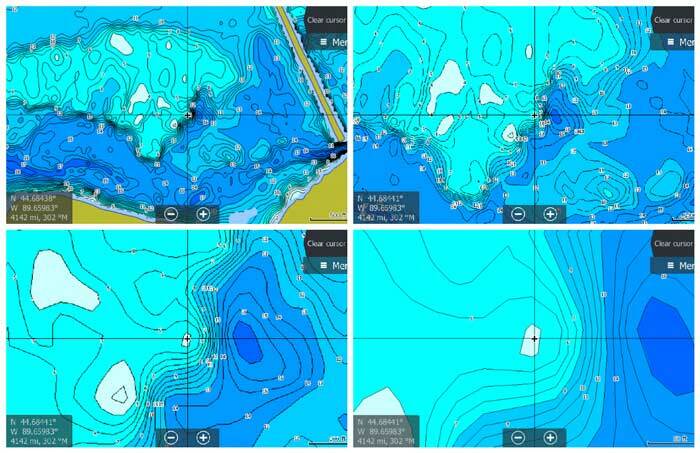 You will get to use premium charts C-MAP Navionics, C-MAP Genesis and more, to give you superior detail and, contour shading, tide information, etc. While this unit can save about 3,000 waypoints, it can still create up to 100 routes. You will be able to track plotting functions and record up to 100 tracks, within 10,000 plots per track. This gorgeous feature offers a SolarMax Display that houses a LED backlight. This backlight offers optimal visibility even in direct sunlight. The display angle visibility is 70°/50°/70°/70° top/bottom/left/right. The good news is that the unit has a colorful display coupled with a horizontal layout. It has a pixel matrix of 800H x 480V, which delivers a sharp and crisp imaging. 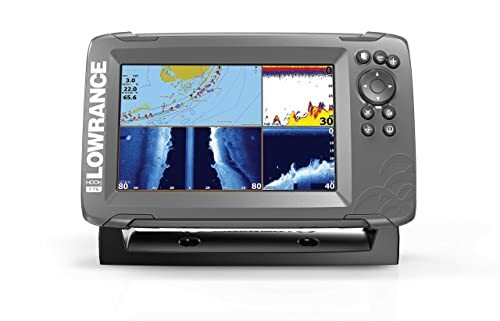 The Lowrance HOOK2 5 - 5-inch is IPX7 waterproof, meaning it can withstand rainfall, water exposure, and snow with no problem. The design is tightly sealed without allowing water to damage the metallic parts of the unit. It also has a microSD card slot, which is skillfully placed on the right side of the unit. This will let you upgrade the internal software, upgrade its charts database, and transfer data. Just like any other unit, this device also comes with its own downsides. It has a short transducer cable that requires you to buy an extension cable. It doesn't offer networking features, and the included transducer is not ideal for ice fishing. And the fact it offers only one MicroSD card slot makes it a hassle to insert and remove. If you want to go ice fishing, you will have to buy a version of it that is HOOK2-5 Combo Ice Machine, this version was reviews in our post about the top rated ice fishing fish finder and flasher in 2018. The Lowrance HOOK2 TripleShot & SplitShot comes as a revamped version of the Hook2 series as it offers a big and bold HOOK2 12 inch design and the 5 sizes, which are the 5, 7 to 9 and 12-inch size. The Hook2 TripleShot & SplitShot offers a new 2-in-1 skimmer transducer and also has DownScan and High CHIRP technology to give you the best fishing experience. 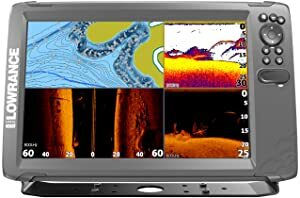 DownScan and Side-scan sonar allow you to see the fish arches better with the vegetation or structure viewed in DownScan crisp and bright display. Just like the Elite and Hook transducers, this unit also sports a molded-in rib that lets you mount it against a trolling motor housing. It also comes with a TrackBack feature that lets you record sonar feed, and allows you to scroll back through the sonar history to review a specific spot. Another nice feature is that the HOOK2 TripleShot fish finder flaunts an internal GPS, alongside 3,000 preloaded lake maps with 1 ft contour lines. I also admire the included Fish ID 2D sonar mode feature, which allows fish icons to the fish arches. Meaning, this feature interchange the sonar returns that it deduces to be fish. Circular Flasher and A-Scope are also available. For ice or stationary fishing, the included Circular Flasher mode assigns all the sonar information into a ring format while it displays the depth in the middle. Also, the A-Scope comes with a vertical flasher which is displayed next to the 2D view and, shows in detail the most recent sonar beam. Did I mention that the Hook2 also delivers a high-sensitivity internal GPS? Its operating frequency is estimated to be about 5 Hz, meaning that it will deliver position fixes five times per second. The device can also make use of position enhancements from EGNO, SWAAS, and MSAS satellites to let you see coordinates of any point of interest and display and calculate the speed of your boat. TripleShot transducer gives you DownScan sonar (straight down), SideScan sonar (up to 300' to each side), and CHIRP sonar (fish arch) views. Preloaded CMAP mapping with 1-foot contours for over 3,000 lakes plus standard coverage of an additional 9,000 lakes. The trail recording functions and waypoints routes are also available here to give you the best spot to locate fish. While this may sound great, this unit doesn't offer super detail, as we hoped for. Even with this, we discovered that it shows the boundaries between water inland accurately and also include various points of interest. 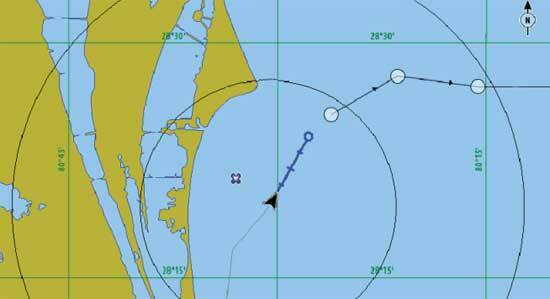 This unit is compatible with Navionics charts to have access to SonarChart Live, to create current icons and to change the tide. It also comes with a StructureMap feature to help you SideScan images to visualize crisp and clear underwater environment. This will give you a better interpretation of your position. 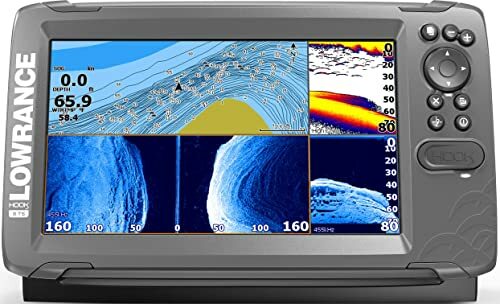 The control unit is a gorgeous feature that lets you view fish in an underwater environment in a 9-inch display WVGA color LCD, sweetened by a pixel resolution of 800H x 480V. To make this sweeter, the display also boasts a SolarMAX type coupled with an adjustable LED backlight. This will ensure you get an excellent picture even in direct sunlight. To make it more gorgeous, the interface of this bad boy is highly intuitive, and its homepage can be customized in multiple ways. The best part is that you can even set up a split-screen from about 4 applications per view. Yes, your guess is right; the HOOK2 7/9/12 delivers a lPX7 waterproofing feature that can withstand water splashes or any incidental water exposure like rain or spillage. One bitter pill about this unit is that it is not touch screen enabled. You can only operate it using the keypad on the right. Lowrance did not include an extended cable. And we also notice that the device is not networkable. It does not offer any networking features like NMEA or Ethernet. The included transducer is not great for ice fishing and with a single Micro SD card, it will be hard to save lots of screenshots. As we’ve mentioned above, this unit doesn’t offer the extensive range of features as the Elite Ti units, or Simrad units. Thus, it doesn’t provide NMEA support or Ethernet support, and it’s not networkable. It does have one microSD card slot, though, for chart upgrades or data transfer. Finally, the box includes both front-dash and the classic gimbal bracket. A unit cover is not included, though. We've had a lot of people asked; what is the difference between the Lowrance Hook and Hook2? In this guide, we will show you the difference. Here is a table below to give you a quick view of the difference between the two models. One significant difference between these two models is that the Hook2 does not feature a touchscreen. It has a well-planned button configuration, which makes it a lot easier and natural for you to navigate the device with less hassle. On the other hand, the Hook features a touchscreen, which a less natural because it misses a few buttons, making them less user-friendly. Because of the easy navigation button of the Hook2, and coupled with the fact that it offers a widescreen Interface of 7” and 9”, the Hook2 offers a more friendly approach than the Hook. The redraw speed of the Hook has been pretty slow beforehand. But since the introduction of the Hook2, it has now boosted with faster internals compared to what you have in the Hook. 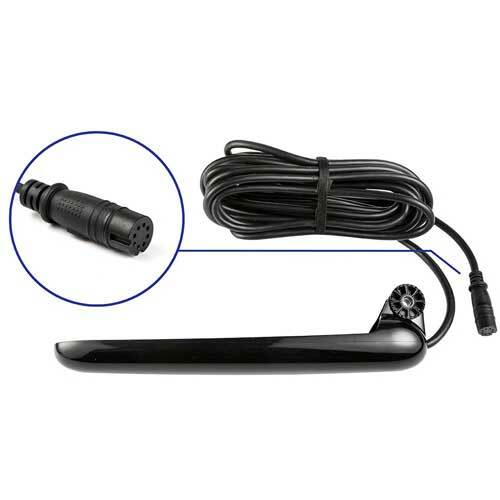 While the Lowrance Hook comes with a turn-knob connector, the Hook2, on the other hand, sports the push-connectors. Unlike, what you will get in the Lowrance Hook series, the Hook2 does not come with manual ducer-selection in the menu. That means using another ducer in it than the 3 new ducers will not give optimal results. While the older Hook version will boast of an 83/200/medium/high chirp, when it is connected to a ducer, the Hook2 has no 83 kHz (or medium chirp). The reason for this change in the Hook2 has upgraded its 22-degree cone angle at 200 kHz to 42 degrees cone angle with Bullet/ SplitShot/ TripleShot. So there's really no need for the 83/ medium-frequency. The Lowrance Hook did not include the gorgeous Broadband Sounder Module we all loved in Elite Ti and HDS. But thank goodness, the Hook2 features the BSM-based software, even at a low price to give you less tinkering with settings. Unlike the Hook device, the Lowrance Hook2 flaunts an "Autotuning Sonar" feature to help you clutter noise and give you a precise fish targets as the conditions change. Apart from this, the autotuning feature is built around the Lowrance 200kHz ultra-wide beam transducer. While the Lowrance Hook failed to include the SolarMax feature, the Hook2 decide to pick up the mantle by housing a SolarMax Display with LED backlight. This gives more optimal visibility and direct sunlight and a colorful display, alongside a delivering very sharp and crisp imaging. With a touchscreen display, the Hook series open the doors for ease of operations with just a single touch of the screen. But the truth is that the touchscreen is expensive and often cost more than other models. Hence, one of the reasons why the new Lowrance Hook2 offers an easy to use interface, which translates to easy to use operations and high-end features to make your fishing hunt a lot more fun. The fact that the Hook2 provides a more comprehensive screen format to allow you have a viewable screen area and gorgeous features that let you use the device to catch fish, make it the go-to unit for anglers. To have this fixed, get the 57.6.94 software Navico and the issue will be fixed. When this happens, edit the data fields by heading to the menu options of the page you want to edit. After that, select the SOG option. This will show you the unit to display the speed ground in the data location you have selected. Marine electronics monitors can be seen in the sunlight. These screens have more powers compared to displays on a phone and tablet screens of the same size. The Hook2 has no X supports Map, and the ones with X does not support mapping ( avionics and charting capability). Most people confuse this concept. So, ensure you don't get confused when want to choose a version with Map support. The Lowrance Hook2 7 offers a split-shot with maps for a reasonable price, but it excluded the side view imaging. The Garmin on its own has no maps. So, I think the Hook2 takes Lion's share. The answer is No! The HST-WSBL isn't retired yet. It is still a gorgeous and a standard transducer for HDS series. The Hook2 still stand firm and blazing with its new line of transducers, Bullet Skimmer, charting, TripleShot, and SplitShot HDI. To use the Hook2 with the WSBL is a breeze. You can use this via the WSBL adapter, and it is not the conventional transducer that comes out of the box. Also, keep this in mind that Hook2 transducers are not compatible with any other displays beside Hook2. The introduction of the SplitShot transducer paves the way for a Wide-Angle High CHIRP and DownScan to let you scan depths up to 500 ft (152 m). The Wide-Angle High CHIRP mode scans up to 300ft (91m) when using DownScan. It can maintain efficient fish targets reading at speeds up to 20-30 MPH. 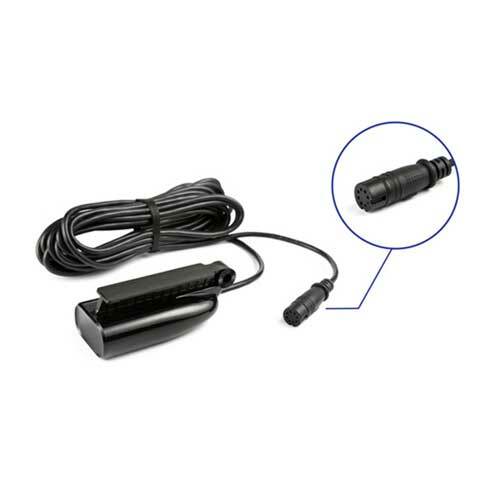 The SplitShot transducer also integrates a temperature sensor and features 20 ft (6 m) of cable, alongside an 8-pin connector. The GPS Features high-sensitivity internal GPS can also use the information from, EGNOS, WAAS and MSAS satellites to deliver the most accurate results possible if they are available in your area. The GPS will calculate the speed of your vessel and show you coordinate patterns. The C-MAP Charts will give a high-detail US mapping alongside 1-foot contours for more than 3,000 lakes. 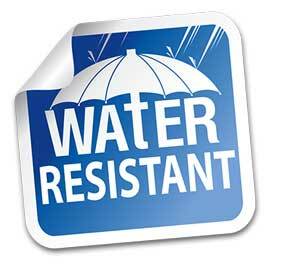 The included Waterproofing Feature can withstand rainfall, water exposure, and snow with no problem. Thanks to its tightly sealed design to prevent water from entering the unit. All these exceptional features are nicely and neatly packed in the Hook2 - 5 fishfinder. 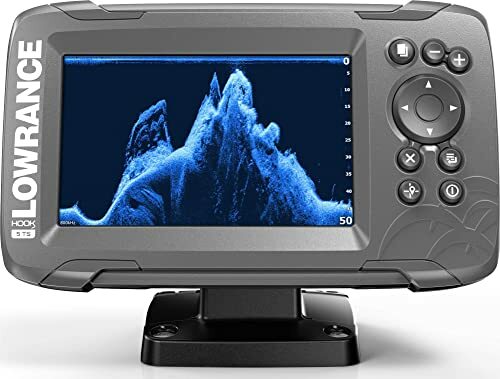 It will be a wise choice to go with this fishfinder for the next fish hunt. Do you have any thought or experience about the best fishfinders to share with us? Let us know in the comments below.